The mansion is getting some face-lifts. drainage on the right side. Due to upcoming construction, the ballroom of the Orianda House will not be available for rentals. Ross Winans was the son of William and Mary Winans, who were cousins. He married twice: First to Julia de Kay (born 10 August 1800 – died 24 May 1850), daughter of Thomas de Kay, a wealthy landowner, and his wife Hannah Blain. He married Julia de Kay on 22 January 1820 and they had five children: Thomas de Kay (1820 - 1878); William Louis (1823 - 1897); Julia de Kay (1825 - 1875); DeWitt Clinton (1838 - 1892); Walter Scott (1840 - 1928). Second to Elizabeth K. West (born 31 July 1807 – died 29 Mar 1889) who he married on 04 Feb 1854 in Baltimore, Maryland. Thomas de Kay Winans was the eldest child of Ross Winans, an important railroad pioneer, and Julia de Kay, daughter of Thomas de Kay, a wealthy landowner, and his wife Hannah Blain. He married Celeste Marguerite Louise Revillon on 23 August 1847 in Alexandroffsky, Russia. She was the eldest of eleven siblings by her father George Revillon and mother Marguerite Louise Bonjour. She was Russian born of Italian and French ancestry and died young following the still birth of her fifth child, Thomas Winans, on 19 March 1861 and was distinguished for her extensive charities including the Winans Soup Station. They had four other children: George (1849 - 1851); Ross Revillon (1850-1912); William George (1852-1871); and Celeste Marguerite (1855-1925). On 01 Jun 1854, Thomas Winans' younger sister, Julia de Kay Winans, married George William Whistler, son of Major George Washington Whistler and Mary Roberdeau Swift, his father’s first wife; after her death he married his good friend and fellow railroad engineer William Gibbs McNeill’s sister Anna Matilda McNeill, mother of James (Abbott) McNeill Whistler (of “Whistler’s Mother” fame) and George William’s half-brother. Thomas Winans was James (Abbott) McNeill Whistler’s first patron and a collector of his early works of art including the Portrait of Anna Denny, the Fishwife, copy after Boucher's 'Diane au bain', and Wapping. Some say Whistler prepared a portrait of Thomas Winans before he left for Europe, but it has not been found. Matthew Brady photographed Thomas Winans as a successful, affluent American citizen in the late 1850s. 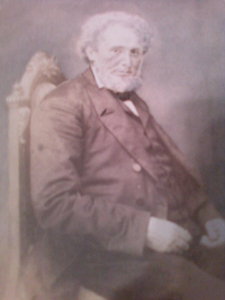 William Louis Winans was the second child of Ross Winans, an important railroad pioneer, and Julia de Kay, daughter of Thomas de Kay, a wealthy landowner, and his wife Hannah Blain. In about 1851 he married Maria Anne de La Rue who was born in England in 1825 and died 18 December 1904 in London, England. They had two sons both born in St. Petersburg, Russia and both died in England: Walter Winans (1852-1920) and Louis William Winans (1857-1927). Julia de Kay Winans was the only daughter of Ross Winans, an important railroad pioneer, and Julia de Kay, daughter of Thomas de Kay, a wealthy landowner, and his wife Hannah Blain. She married George William Whistler was the son of George Washington Whistler and his first wife Mary Roberdeau Swift. They had five children: Julia de Kay (1855-1930); Thomas Delano (1857-1921); Ross Winans (1858-1927); Catherine Neva Beatrice (1860-1907); and Joseph Swift (1865-1905). George William Whistler was the son of George Washington Whistler and his first wife Mary Roberdeau Swift. He married twice: First to Mary Ann Ducatel, by whom he had one child, George Worthen (1851); Second to Julia de Kay Winans, the daughter of Ross Winans, by whom he had five children: Julia de Kay (1855-1930); Thomas Delano (1857-1921); Ross Winans (1858-1927); Catherine Neva Beatrice (1860-1907); and Joseph Swift (1865-1905). DeWitt Clinton Winans was the fourth oldest child of Ross Winans, an important railroad pioneer, and Julia de Kay, daughter of Thomas de Kay, a wealthy landowner, and his wife Hannah Blain. He married a Belgium by name of Mathilda Levaux (1838-1903) between July–September 1869 at St. George Hanover Square, London, Middlesex, England. They had no children and lived in Brighten, England near other Winans family members. Walter Scott Winans was the youngest child of Ross Winans, an important railroad pioneer, and Julia de Kay, daughter of Thomas de Kay, a wealthy landowner, and his wife Hannah Blain. He married Elizabeth Howell (1842-1926), daughter of John Howell, a farmer near London in about 1880. They had one son: Thomas Winans (1881-after 1956). In 1888 he was living at 22 Brechin Place, London. Walter died in a nursing home in 1928. Ross Revillon Winans was the oldest surviving child of Thomas de Kay Winans and Celeste Marguerite Louise Revillon. He married twice: First to Mary Elizabeth (Minne) Greenway Ludlum (1851-1872) on 10 January 1872 and second to Catherine Neva Beatrice Whistler (1860-1907) on 20 May 1877 in London, his first cousin and daughter of George William Whistler and Julia de Kay Winans, his aunt and daughter of Ross Winans. They had four children: Neva Marguerite (1881-1883); Beatrice (1884-1907); Thomas George (1886-1941); Ross William (1887-1907). Celeste Marguerite was the only daughter of Thomas de Kay Winans and Celeste Marguerite Louise Revillon born in Paris, France. She married Gaun McRoberts Hutton (1846-1916) in Paris, France on 3 September 1883, following the death of her father, Thomas. Celeste meet Guan, and Irish born American Diplomat while she was living in St. Petersburg, Russian where he was serving at the Court of Czar Alexander II. They had four children: Elsie Celeste Hutton (1884-1996) who did not marry; Lucette Marguerite Hutton (1885-1957) who married Harold Adye Prichard, an Oxford education Anglican priest, they had seven children; Una Louise Hutton (1888-1918) who did not marry; and Reginald Winans Hutton (1894-1936) who married Mabel Dorothea Finn, they had three children only one of whom survived to adulthood, but did not marry. © 2006 Friends of Orianda House. All Rights Reserved.